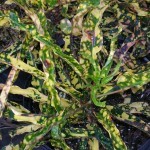 The Versatile Crotons - Richard Lyons Nursery, Inc. While Richard Lyons’ Nursery is known for its tremendous variety of flowering trees and shrubs, blossoms aren’t the only way to color up a landscape. Leaves can also be used to great advantage, and tropical plants ‘leave’ temperate species in the dust when it comes to colorful foliage. 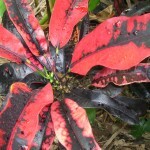 Among the most successful and popular plants grown for their chromatic leaves are crotons (Codiaeum variegatum). The genus is native to Malaysia, Indonesia, western Pacific islands and, according to some authorities, southern India, Sri Lanka and northern Australia. 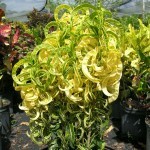 But they have become ubiquitous around the humid tropics for their ornamental appeal. They grow well in a wide range of soil types, so long as good drainage is provided. Crotons have been featured in this space before (“Looking for Shady Friends,” July 12, 1913), but that was with respect to one of the few cultivars, Mrs. Iceton, that does well in low light. 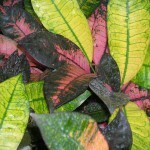 Most crotons produce their best coloration in much sunnier exposures. Over the years, zealous growers have developed hundreds of cultivars with endless mixes of shades and hues. 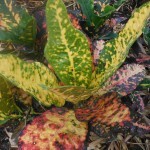 Even on a single plant, upper leaves and lower leaves may exhibit differing colorations. But crotons’ diversity doesn’t end there. Leaf shapes also vary over a wide range, from broad to narrow, long to short, linear to ovate—and even lobed like maple leaves! The combinations are seemingly inexhaustible. Finally, crotons are versatile in their applications in the landscape. Taller cultivars may be showcased as stand-alone specimens, while shorter-growing types lend themselves well to use as hedges or mass plantings. As hedges, they’re probably best-exhibited when trimmed into informal, rather than boxy, shapes. 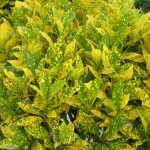 (Take care when pruning not to have prolonged contact with the plants’ irritating milky latex.) And don’t overlook crotons’ ability to thrive in containers. There is a nice selection of crotons at the nursery. Stop by to determine the ones that will work for you. All purchases must be picked up at the nursery. © 2019 - Richard Lyons Nursery, Inc.